In this life, we are defined by our actions: our partners at Capatriti have made it their mission to bring honesty and transparency to the olive oil business while they wander the world in search of the best. The result? The first brand to earn the USDA Quality Monitoring Program seal on both Extra Virgin and 100% Pure olive oils. No small feat. This kind of tireless dedication is shared by chefs in their never-ending quest for peerless ingredients—chefs like Olmsted’s Greg Baxtrom, who never stop seeking ways to serve better, more thoughtful creations. Here's to those—olive oil producers, chefs, and you, dear reader—who live or die by their convictions. A school of crawfish swims in an old-fashioned bathtub. A few caged quails cluck softly from their home above handsome raised garden beds, which house everything from strawberry plants to sunchokes. Brooklynites sit on wooden benches under cafe lights sipping cocktails and snacking on small bites — all influenced by the flora and fauna of the garden around them. 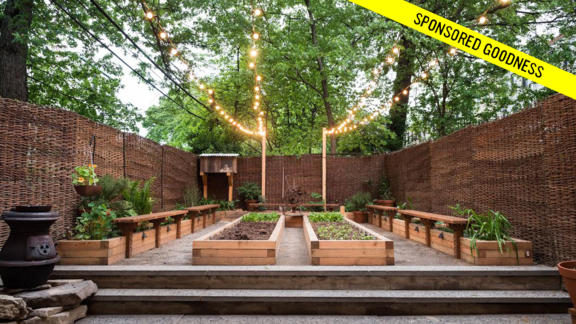 This is the backyard at Olmsted, the critically-acclaimed Prospect Heights restaurant from chef Greg Baxtom. The space is equal parts culinary laboratory, classroom, waiting area, and romantic backdrop: a fitting amalgam of Baxtrom’s career, which has spanned some of the country’s most innovative and pedigreed restaurants. Now he’s taken the skills and ingredient sourcing he learned at each, and opened his first restaurant with horticulturist partner Ian Rothman. Baxtrom’s goal at Olmsted is simple: To deliver a fine dining experience at neighborhood restaurant prices. (New York City neighborhood restaurant prices, anyway.) Nothing on the menu costs more than $25, with most of the plates in the $8-$16 range. But that doesn’t mean that Baxtrom is sacrificing on what he’s serving to his customers, nor serving portions so small that diners leave hungry. Instead, he says he’s using the same suppliers as New York’s finest restaurants — just being a little more creative with how he uses them. In this day and age, this kind of consideration and creativity around sourcing is non-negotiable for any chef hoping to resonate with their guests. The products and stories you choose to align with—even down to your olive oil, the workhorse of any kitchen—matter, and staying true to those convictions in a zero-sum game like restaurants makes the effort all the more valiant. Perfectly shaped scallops may not be in the budget, but he buys the bits that are broken during the shucking process. These retain the oceanic sweetness of the most pristine specimens, even when they’re served on a skewer. Guinea hens come from a nearby farm, which also supplies many of New York’s fine dining restaurants (at the Flatiron District’s Le Coq Rico, a 98-day aged bird goes for $98 apiece). Their hens are just too expensive to serve simply roasted or otherwise traditionally prepared at Olmsted, but the team decided to take the bird apart, make a mousse with the trim, stitch it all back together and make it into three orders instead of two — a technique that he learned at Per Se. Baxtrom knew he wanted to work in fine dining ever since he left high school and entered the culinary program at Kendall College in Evanston, Illinois. That program led him to an externship in France, then back to Chicago for a role in the kitchen at Grant Achatz’s modernist restaurant Alinea, where he eventually became a sous chef. From there, he moved onto kitchens at an enviable array of restaurants: Neo-Nordic cooking at Lysverket in Norway, classical French technique at Per Se, and intense farm-to-plate ethos at Blue Hill at Stone Barns. When he decided to open his own restaurant, he knew that he was going to incorporate elements of all of his previous employers. That Stone Barns influence shines the most brightly in the backyard, which brings an element of the farm experience into the city. Hardly anything on diners’ plates comes from those planters and quail cages, of course — a small Brooklyn backyard can hardly serve a buzzy 40-seat restaurant, even with plans to double the space in the coming months. But what is grown back there is meant to showcase and enhance particular ingredients on the menu. A nod to the crawfish arrives in the form of puffed crackers, seasoned with all the spices of a traditional boil; strawberries might be featured in a cocktail; sunchokes might be a garnish for the guinea hens. Everything is intentionally grown to complement the seasonally changing menu. Rothman, who tended to a basement micro-farm at Tribeca’s Atera before joining Baxtrom, brings a horticulturist’s eye to the garden, which runs on a closed-loop system. Food scraps are feed to black larvae, which are then fed to the crawfish and guinea hens. The crawfish tub is placed over a heating vent from a kitchen, which keeps it warm even in the winter. None of this is necessarily discernible to the naked eye. Diners can be as curious as they want about everything growing, or they can also just take a selfie and enjoy their date or a balmy evening with a cocktail. Baxtrom is adamant that Olmsted’s mission isn’t to preach the values of sustainability or environmental stewardship — that’s all there if his guests want to know about it, but his personal satisfaction comes in doing it regardless of whether he spreads the word or not. Not, you know, literally. Primo Chef Melissa Kelly has two feet, on very solid ground.